This briefer version of the authors’ highly successful Modern System Analysis and Design is a clear presentation of information, organized around the systems development life cycle model. 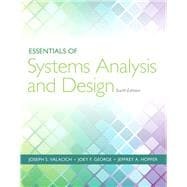 Designed for courses needing a streamlined approach to the material due to course duration, lab assignments, or special projects, it emphasizes current changes in systems analysis and design, and shows the concepts in action through illustrative fictional cases. Features a clear presentation of material which organizes both the chapters and the book around The Systems Development Life Cycle Model, providing students with a comprehensive format to follow. Joseph S. Valacich is an Eller Professor of Management Information Systems in the Eller College of Management at the University of Arizona. He has had visiting faculty appointments at Buskerud College (Norway), City University of Hong Kong, Norwegian University of Life Sciences, Riga Technical University (Latvia), and Helsinki School of Economics and Business. He received a Ph.D. degree from the University of Arizona (MIS), and M.B.A. and B.S. (computer science) degrees from the University of Montana. His teaching interests include systems analysis and design, collaborative computing, project management, and management of information systems. Professor Valacich cochaired the national task forces to design IS 2010: The Model Curriculum and Guidelines for Undergraduate Degree Programs in Information Systems. He also served on the Executive Committee, funded by the National Science Foundation, to define the IS Program Accreditation Standards and on the Board of Directors for CSAB (formally, the Computing Sciences Accreditation Board), representing the Association for Information Systems (AIS). He was the general conference co-chair for the 2003 International Conference on Information Systems (ICIS), and the co-chair for the Americas’ Conference on Information Systems (AMCIS) in 2012. Prior to his academic career, Dr. Valacich worked in the information systems field as a programmer, systems analyst, and technical product manager. He has conducted numerous corporate training and executive development programs for organizations, including AT&T, Boeing, Dow Chemical, EDS, Exxon, FedEx, General Motors, Microsoft, and Xerox. Dr. Valacich is the co-Editor-in-Chief for AIS Transactions on Human-Computer Interaction, a senior editor at MIS Quarterly and was formerly an associate editor for Information Systems Research. He has published more than 200 scholarly articles in numerous prestegious journals and conferences. His scholarly work has had a tremendous not only on the field of information systems, but also on a number of other disciplines, including computer science, cognitive and social psychology, marketing, and management. In February 2014, Google Scholar lists his citation counts over 13,800, with an H-index of 54. He is also a coauthor of the leading Modern Systems Analysis and Design (Seventh Edition) and Information Systems Today (Seventh Edition). Joey F. George is professor of information systems and the John D. DeVries Endowed Chair in Business at the Iowa State University College of Business. Dr. George earned his bachelor’s degree at Stanford University in 1979 and his Ph.D. in management at the University of California at Irvine in 1986. He was previously the Edward G. Schlieder Chair of Information Systems in the E. J. Ourso College of Business Administration at Louisiana State University. He also served at Florida State University as Chair of the Department of Information and Management Sciences from 1995 to 1998. Dr. George has published dozens of articles in such journals as Information Systems Research, Communications of the ACM, MIS Quarterly, Journal of MIS, and Communication Research. His research interests focus on the use of information systems in the workplace, including computer-based monitoring, computer-mediated deceptive communication, and group support systems. Dr. George is coauthor of the textbooks Modern Systems Analysis and Design, Seventh Edition, published in 2014, and Object-Oriented Systems Analysis and Design, Second Edition, published in 2007, both from Pearson. He has served as an associate editor and senior editor for both MIS Quarterly and Information Systems Research. He served three years as the editor-in-chief of the Communications of the AIS. Dr. George was the conference cochair for the 2001 ICIS, held in New Orleans, Louisiana; conference chair for the 2012 ICIS held in Orlando, FL; and the doctoral consortium cochair for the 2003 ICIS, held in Seattle, Washington. He is a Fellow of the Association for Information Systems (AIS) and served as President of AIS in 2010—11. Jeffrey A. Hoffer is the Sherman—Standard Register Professor of Data Management for the Department of MIS, Operations Management, and Decision Sciences in the School of Business Administration at the University of Dayton. He also taught at Indiana University and Case Western Reserve University. Dr. Hoffer earned his B.A. from Miami University in 1969 and his Ph.D. from Cornell University in 1975. Dr. Hoffer has coauthored all editions of three college textbooks: Modern Systems Analysis and Design, with George and Valacich; Managing Information Technology: What Managers Need to Know, with Brown, DeHayes, Martin, and Perkins; and Modern Database Management, with Ramesh and Topi, all published by Pearson Prentice Hall. His research articles have appeared in numerous journals, including the MIS Quarterly—Executive, Journal of Database Management, Small Group Research, Communications of the ACM, and Sloan Management Review. He has received research grants from Teradata (Division of NCR), IBM Corporation, and the U.S. Department of the Navy. Dr. Hoffer is cofounder of the International Conference on Information Systems and Association for Information Systems and has served as a guest lecturer at the Catholic University of Chile, Santiago, and the Helsinki School of Economics and Business in Mikkeli, Finland.